The green plateau of Hadoti, which starts with the hilly terrain of Bundi and meanders down to the Chambal valley of Kota, is in southeast Rajasthan. The princely state of Jhalawar lay to the south of Kota along the Rajasthan-Madhya Pradesh border, and the city of Jhalawar is located on the highway connecting the capitals of both modern states, Jaipur and Bhopal. Founded in 1796 by Zalim Singh Jhala, a general and minister in Kota state, Jhalawar takes its name after the ruling Rajput clan. Since it was a relatively new state, buildings like the Prithvi Vilas Palace (above) utilize modern designs. It's construction was completed in 1912 by Raja Bhawani Singh. An interesting historical tidbit: the Jhala Rajputs are originally form Gujarat and a stretch of land in that neighboring state is also called Jhalawar! 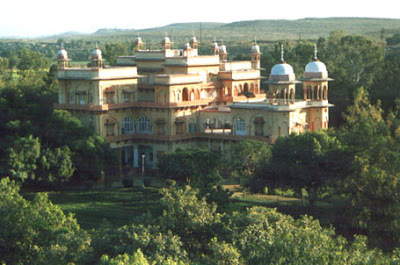 The older Garh Palace in the middle of the town is now used as a government office. Another interesting heritage building in Jhalawar is the Bhawani Natya Shala. Used as a theater, the Bhawani Natya Shala's unique architecture features an underground passage that allows horses and chariots to appear on stage. It was built in 1921 by Maharaja Bhawani Singh and named after him. 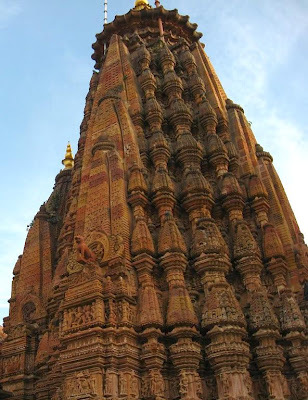 However places in Jhalawar do have buildings with 1000-year old architectural designs, like the Surya Mandir (Sun Temple above photo) in Jhalrapatan which is a 100 feet tall. Known as the Padam Nath temple, it was built in the 10th century by the Parmar Rajputs, and features elaborate carvings and sculptures. There are many other hidden treasures in Jhalawar, since it is far away from the tourist circuit of Rajasthan, like Bhimsagar Dam, Atishey Jain Temple, Gagron Fort, and Buddhist caves and stupas.